Ficus (Ficus benjamina), or weeping fig, is a popular houseplant that grows best in a sunny, draft-free location. Unlike other houseplants, the ficus tree prefers to be root bound. For this reason, a ficus tree can grow 6 to 8 feet tall and 4 to 5 feet wide while planted in a pot that's small relative to its size. A fast grower, ficus trees need frequent pruning to keep a natural, tree-like form. Pruning also allows light to reach the inner leaves and branches. Stand back from the potted ficus tree and decide what limbs can be trimmed to give the plant a natural, tree-like shape. Look for limbs that interfere with foot traffic as well as limbs that are growing against a wall or window that should be removed. Prune unruly branches back to the main trunk or main stem. If you are cutting a limb to limit the spread of the plant, cut the limb back to a "Y" where another limb is growing upward to train the growth upwards instead of outwards. This helps the plant retain a natural shape. Cut limbs back to the natural collar where the limbs meet; don't cut flush against a main stem, as this will delay the natural healing process. Stand back and examine your progress after each cut. Trim out dead and spindly growth from around the trunk and main limbs. 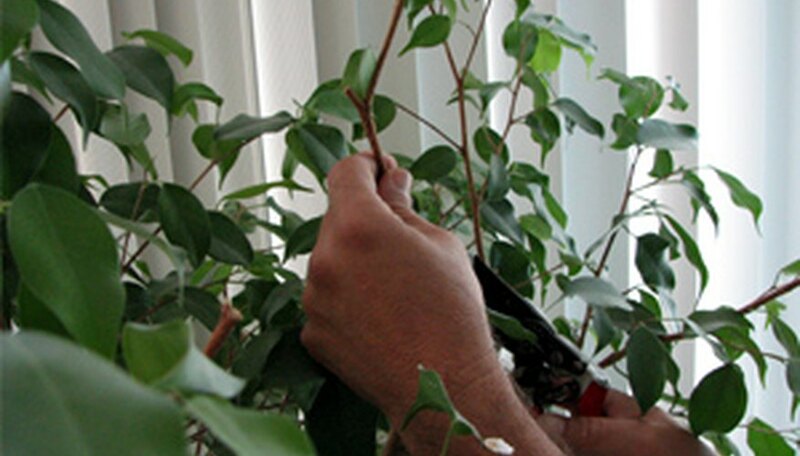 When trimming a potted ficus tree to bring up the bottom of the canopy, trim the ends of the limbs back to an upward-growing branch or "node," as described in step 2. Removing an entire limb may leave an empty space in the side of the canopy. After trimming, water, apply a diluted fertilizer and add more potting soil, if needed. Shearing the tree into a round or ball shape will cause the shaded area inside the tree's mast to become woody from lack of light. Shearing the tree straight across the top is not recommended and creates an unnatural look. Trim a large, unruly tree several times over a period of three months until you reach the desired shape. Removing too much green at one time can shock or kill a potted ficus tree. Ficus trees "weep" a white latex substance from wounds caused by pruning that can stain some floors and cause a minor allergic reaction in some people.